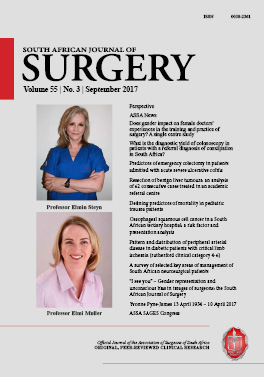 Background: Previous surveys of neurosurgical patient management, including a South African (SA) survey conducted in 2001, confirmed the existence of significant dissimilarities in management on national and international levels. This survey aimed to determine current SA neurosurgical patient management and to compare this with international trends. Methods: Questionnaires in multiple choice question (MCQ) and free text entry format covering key areas of neurosurgical practice were emailed to SA neurosurgeons following ethics approval. All responses were captured anonymously. Results: The response rate was 53%. Demographically only 5.7% respondents were younger than 40 years, 59.3% obtained a local college fellowship, 14.8% an international fellowship, 40.7% a MMed and 16.6% obtained more than one postgraduate qualification. Public sector specialists predominantly practised intracranial surgery (69%) while private specialists practised mainly spinal surgery (58%). Years in specialist practice were negatively associated with endoscopic surgery (p = 0.014) and decompressive craniectomies (p = 0.008) but not with other more recently introduced techniques including pedicle screws, neuro-navigation and cell-saver techniques. Age per se had no influence on practice. In subarachnoid haemorrhage (SAH) disease, 88% routinely administered nimodipine, 8% restricting its use to managing vasospasm. Endovascular coiling, more recently introduced for intracranial aneurysm management, was preferred to surgical clipping (54%); 69% preferred total intravenous to inhalational anaesthesia with propofol primarily replacing thiopentone for brain protection. 27% still utilised the sitting position. Only one incident of a postoperative visual defect was recorded with prone positioning. Conclusion: With the exception of endoscopic and decompressive craniectomy surgery, overall management in key areas surveyed was in line with international trends.